Forgive my fangirling. If you’ve noticed my last few posts have been about JaDine (James Reid and his ‘partner in crime’ Nadine Lustre). Even my brother is threatening to unfollow me on social media because I’m just so impressed with these two young rising stars from Viva Artists Agency that I’m so happy to see them succeed that I couldn’t help but gush and rave about this duo, so much so that I’ve flooded my FB and twitter with posts pertaining to them. Recently, I did a post to campaign for Nadine to get the wild card slot (which also doubles as why she also deserves a win) for the MTV EMA 2015, for which James was already nominated. After several days of fan tweeting, now they’re both competing for the category (which is weird because they usually move as a team). Still, this has not been the first time these two have had friendly competition between themselves so its still kind of cool. But this post is all about James Reid and why I believe he totally deserved to be nominated and possibly win in this category so let’s focus. I’ve been a fan of James since way back when he was a lanky, shy contestant in the Pinoy Big Brother house in 2010 when, even despite suffering from a medical condition, he proved to the Philippines that he had what it took to emerge as the big winner. It took a few years for him to finally get a new shot at fame (because he wasn’t prepared for stardom then) and I’m glad that now that he’s finally coming out of his shell, he’s showing the world anew just what type of dynamo he is on and off the stage. So without further ado, here’s what I love about James Reid and why I think he deserves to be MTV EMA’s Best Southeast Asian Act for 2015. He’s humble. In a recent interview, James admitted that despite performing hundreds of shows for his adoring fans, he still gets butterflies and he still gets nervous before he goes on stage. He says he relishes the feeling because it keeps him grounded and reminds him of where he is and his reponsibilities to his fans. I think this is an important quality for any artist, even more so for a young and fresh one like James. He has a passion for his craft. James genuinely loves music and has an earphone stuck to his ear in every behind the scenes shot taken of him in any shoot, taping or engagement. Check out his Instagram and his posts are peppered with lyrics from his playlist. I think he learns a lot from listening and watching and improves his craft further by incorporating a variety of styles to his music to keep things fresh and innovative. He is an absolute performer. Despite his super hectic schedule, James gives his 150 percent on stage. Nadine, when asked about what she admires most about James, said that absolutely it was his energy on stage. Nadine said her on screen partner just turns into a different person on stage and electrifies the crowd with his flawless performances of his hits and in turn, the crowd love him to pieces. He had charisma and talent, a potent combination. James is an absolute hottie, but being gorgeous is not a guarantee for success. James backs up his beautiful face with hard work, an undeniable talent for singing, acting and dancing and he is awesome at all of it. He is edgy and artsy. Say what you will about James and his vanity about his hair, but this guy absolutely has potential for art. If ever he gets tired of being in front of the camera, I think he has the artistry to direct awesome music videos, as proven by his short video clips on his IG. His B&W shots and fan art posts are also testaments to his good taste for art. 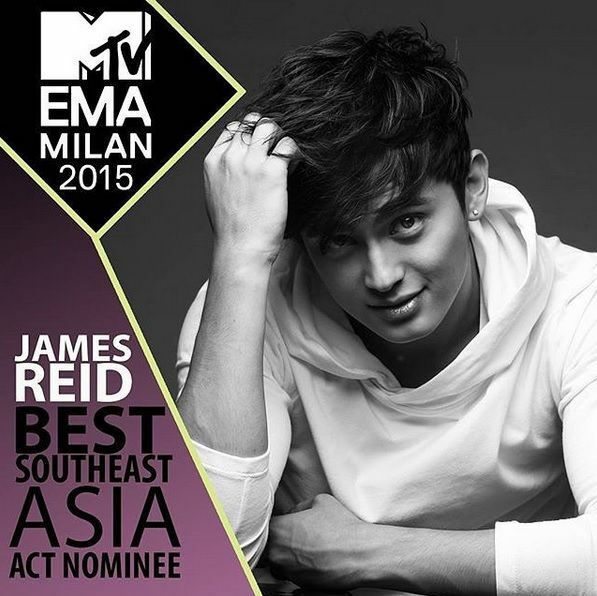 So, have I convinced you enough to get those keypads moving and vote for James for the MTV EMA 2015 best Southeast Asian Act yet? If so, head straight to this link, click on James Reid and spread the love. Check out his video for Huwag Ka Nang Humirit below and don’t forget to check out his other hits too.